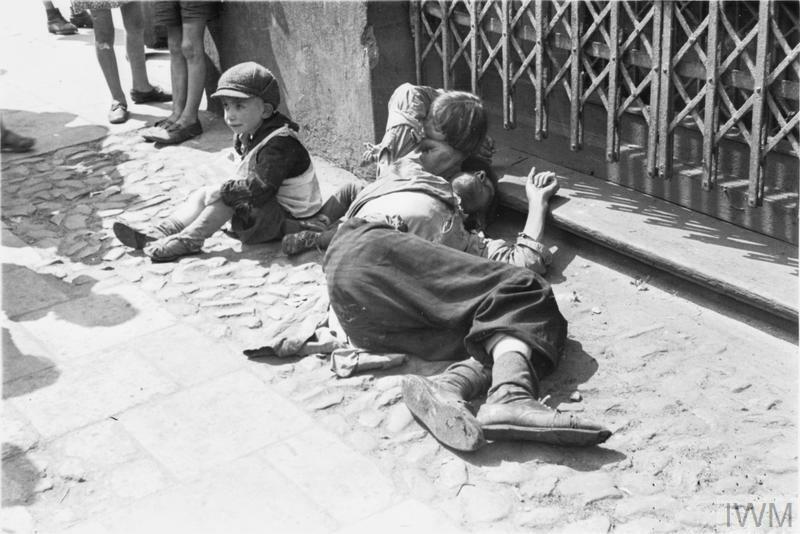 All Jewish people in Warsaw had to relocate to the area of the ghetto by 15 November 1940. The ghetto was sealed on that date. In total 113,000 gentile Poles were forced to resettle to the 'Aryan side' and were replaced by 138,000 Jews from other districts of the capital. 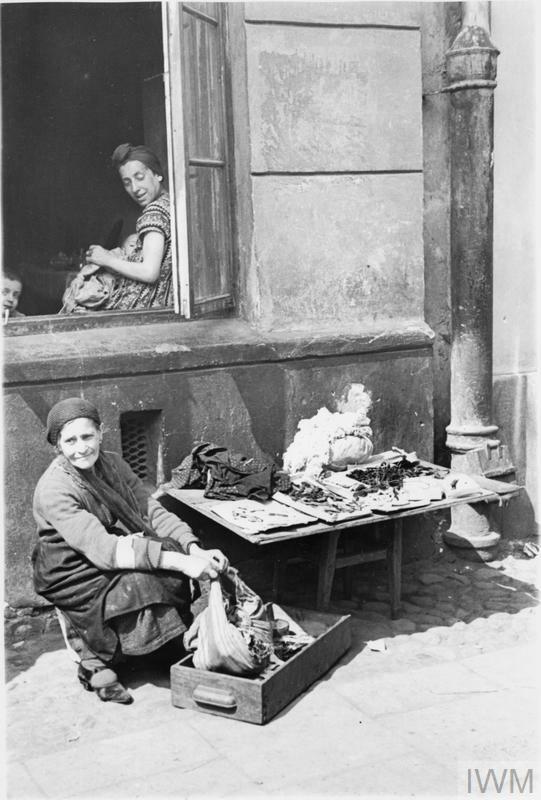 The ghetto reached its highest number of inhabitants in April 1941. 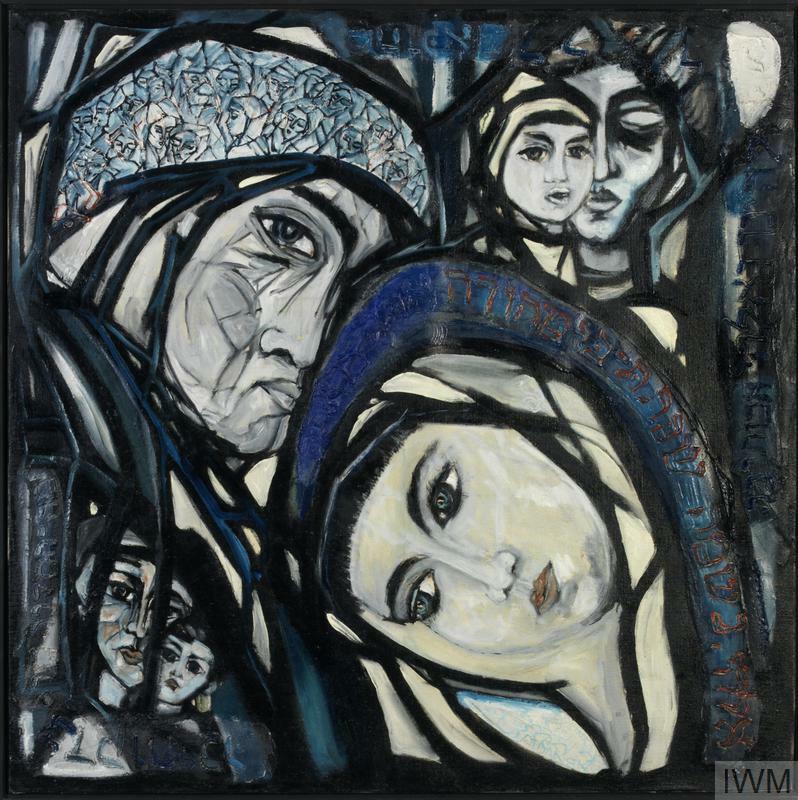 Within its wall lived 395,000 Varsovians (residents of Warsaw) of Jewish descent, 50,000 of people resettled from the western part of the Warsaw district, 3,000 from its eastern part as well as 4,000 Jews from Germany (all resettled in early months of 1941). Altogether there were around 460,000 inhabitants. 85,000 of them children up to the age of 14. The living conditions in the ghetto were very difficult. Density of population was extreme, there were 146,000 people per square kilometre which meant 8 to 10 people per room on average. 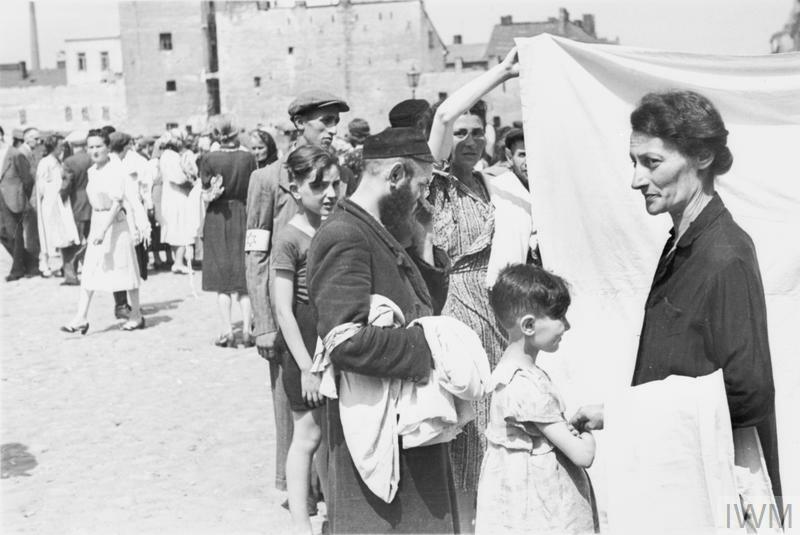 Jews from other districts of Warsaw as well as those from other cities were allowed to bring only the absolute minimum with them – usually personal belongings and bedclothes. That meant instant poverty and great social disadvantage in comparison with original inhabitants of the ghetto's pre-war district. But in general only a very small percentage of the ghetto population had any kind of regular employment or any other source of income. Street trading became a necessity for many and anything could be a subject of exchange. 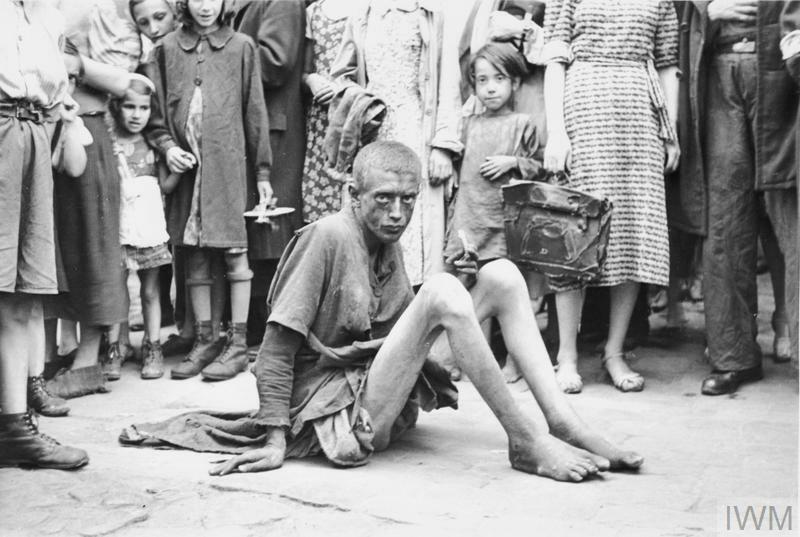 The German administration deliberately limited food supplies to the absolute minimum which caused near starvation amongst the population from the very beginning of the ghetto's existence. 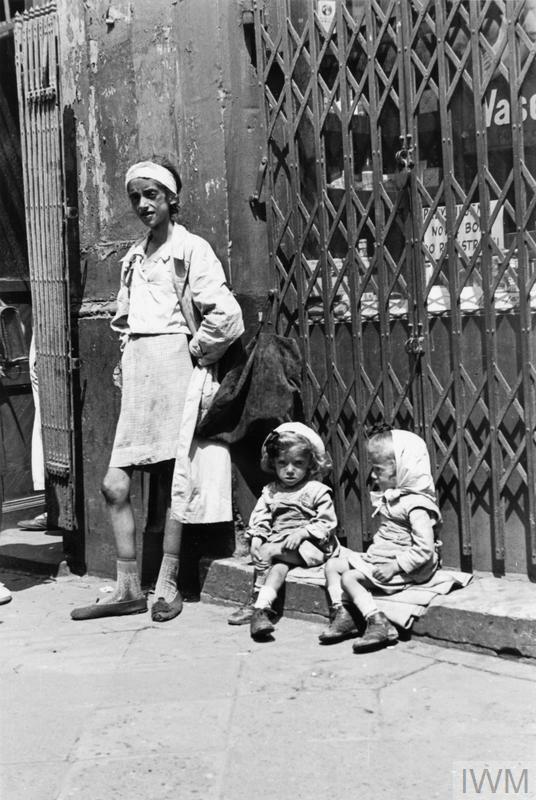 Smuggling food, mainly by children, from the 'Aryan side' was the only option of providing the ghetto with supplies. Malnutrition, overpopulation and lack of medical care brought another deadly factor to the daily life of the ghetto's residents – typhus. Jews who leave the quarter reserved for them without permission are liable to the death penalty. The same penalty awaits any person who knowingly gives shelter to such Jews. Taken from an official German announcement – probably on display on both sides of the ghetto wall. On 21 July 1942 the Nazis began the 'Gross-Aktion Warsaw', the operation of mass-deportation of Jews in the Warsaw ghetto to the Treblinka death camp, 80 km north-east. By 21 September around 300,000 of the Warsaw ghetto residents had perished in the gas chambers at the camp. 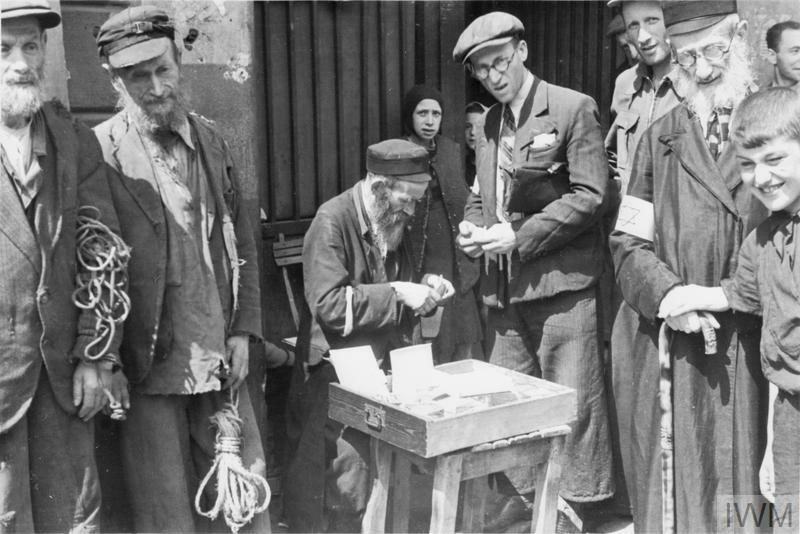 In October 1942 the Germans carried out a new population census – only 35,639 people remained in the ghetto, around 10% of the numbers registered in July of the same year. 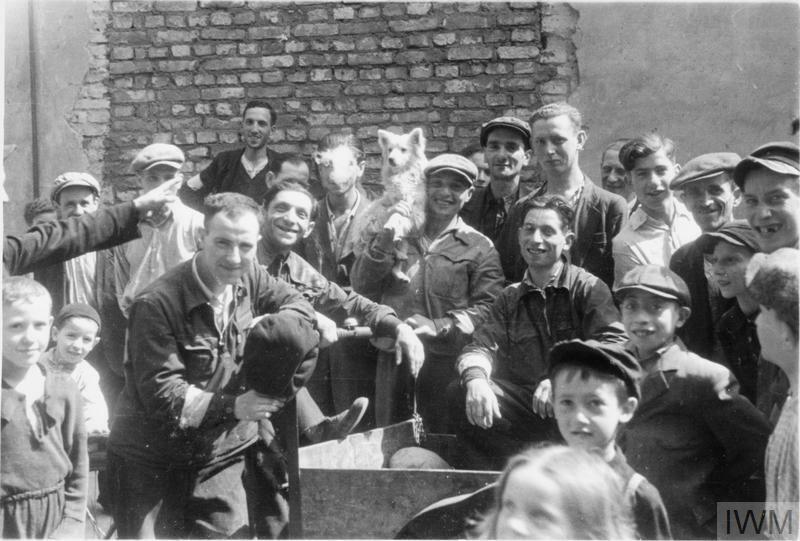 The remaining were mostly Jews employed in various German-run companies, who were allowed to stay and support the German war effort through their labour. In fact the number of remaining inhabitants was much higher; another 30,000 Jews were living in the ghetto unaccounted for. On 19 April 1943 the surviving remnants of the Jewish population of Warsaw rose to fight a final battle against the Nazis. The Nazi troops, led by SS-Gruppenführer Jürgen Stroop, systematically destroyed the Jewish district and eradicated any form of resistance. 56,065 of the remaining Jews of Warsaw were killed in combat, murdered or deported to death camps. By mid-May of 1943 the Warsaw ghetto ceased to exist. In the summer of 1941, Willi Georg, a German Army signalman, visited the ghetto on his commanding officer’s order. 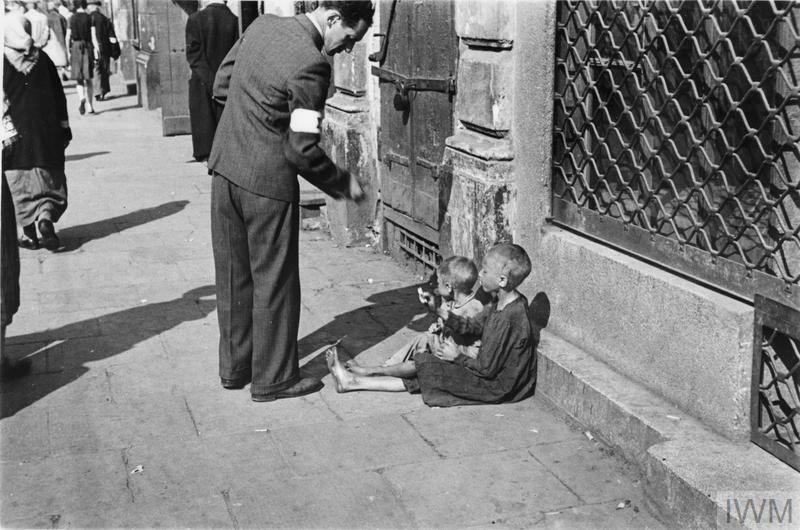 A pre-war professional photographer, he took four rolls of films – around 160 images – during his one day visit to the ghetto. His Leica camera with a fifth roll was confiscated by a German police patrol when he was spotted wandering around Ghetto’s streets. Fortunately for him, the other four in his pocket were not found. There is some mystery about his photographs. Why did many of the photographed subjects seem to respond so positively to him? Could it be he was in his civilian clothes rather than in his uniform? Did the ghetto residents know who he was? In some photographs it appears they did know he was a German serviceman – they remove their hats and look at him with stern faces. Perhaps he introduced himself, or tried to speak to them in broken Polish? Can we assume his attitude towards the people he photographed was sympathetic – after all he preserved the images throughout the war and made them public afterwards. Unfortunately we might never know the answer to these questions. Willi Georg's photographs show a period in the ghetto's history when life for some of the inhabitants was still bearable. People trade in the streets, housewives search for good quality bedclothes, children still find amusement in daily situations. There is even limited selection of food for sale in some of the shops' windows. Trams, operated by workers from the 'Aryan side', provide limited public transport services. At the same time that these things were happening however, many others – particularly children and elderly – were dying of malnutrition in the streets. The contrast is shocking. Their situation is a sign of what was to come for the ghetto inhabitants – starvation, diseases and deportation to death camps. 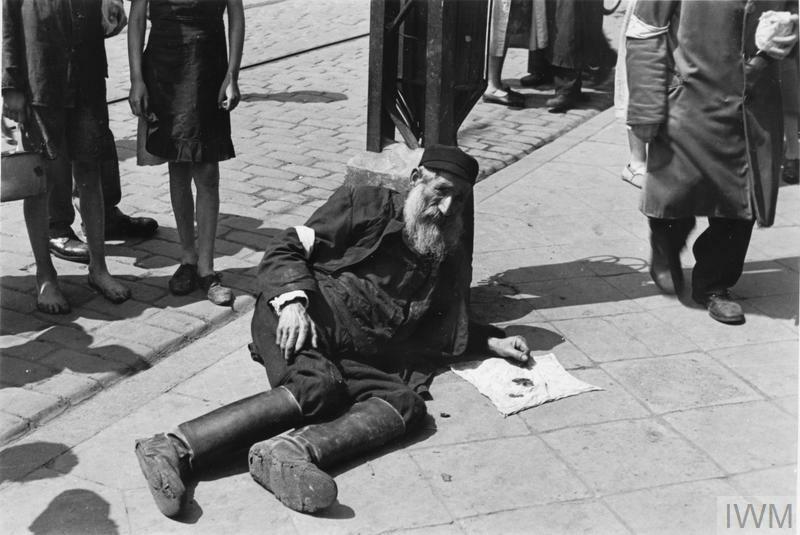 Willi Georg's images are one of four known photographic sets taken by German servicemen in the Warsaw ghetto. Of these four, only part of the Willi Georg collection is in our possession. His pictures speak for themselves. 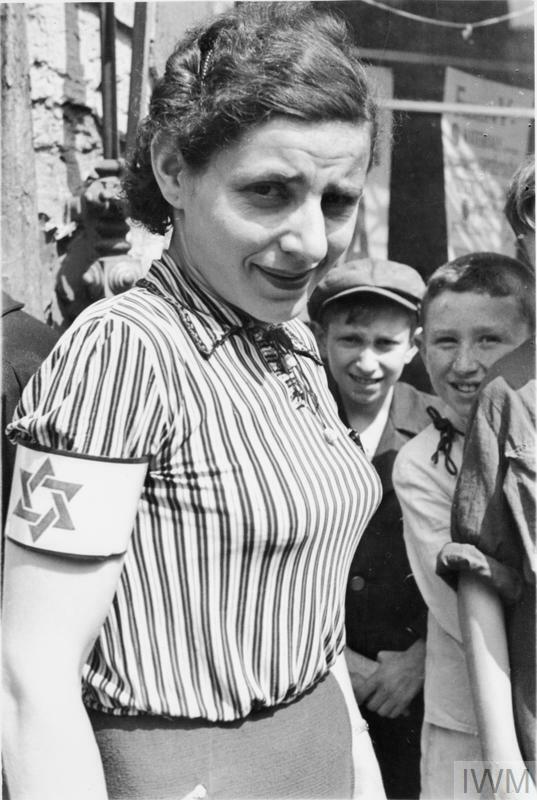 A portrait of a young woman wearing a striped blouse and an armband with the Star of David. 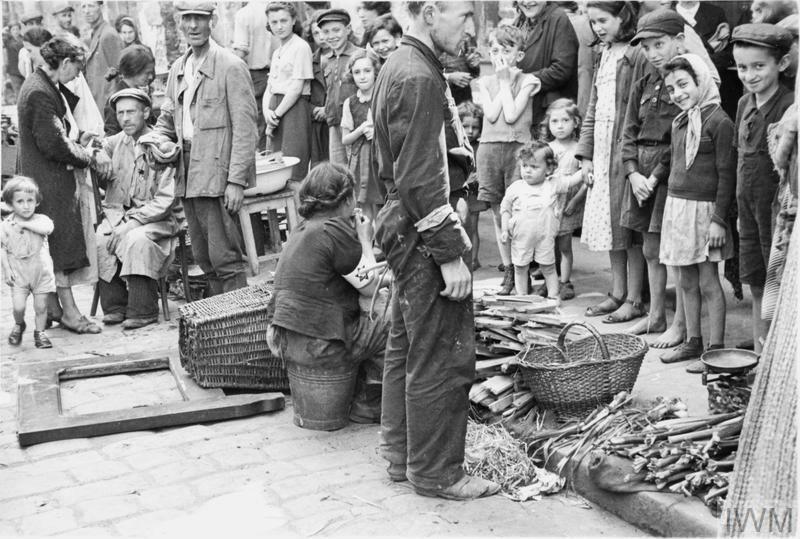 Residents of the ghetto shopping in a vegetable street market. An elderly woman trying to trade her scarce possessions in the street. A woman with two children watches her from the window in the background. A man selling his bread allowance in the street. An armband seller making a transaction in the street. 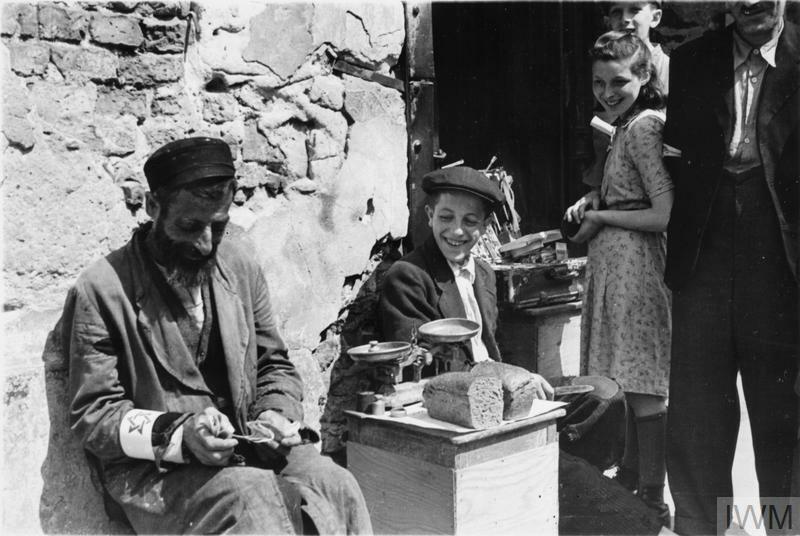 Two elderly men on the left trying to sell pieces of rope – almost anything could be a subject of trade to earn money for food. Ghetto residents buying and selling bedsheets in a street market. 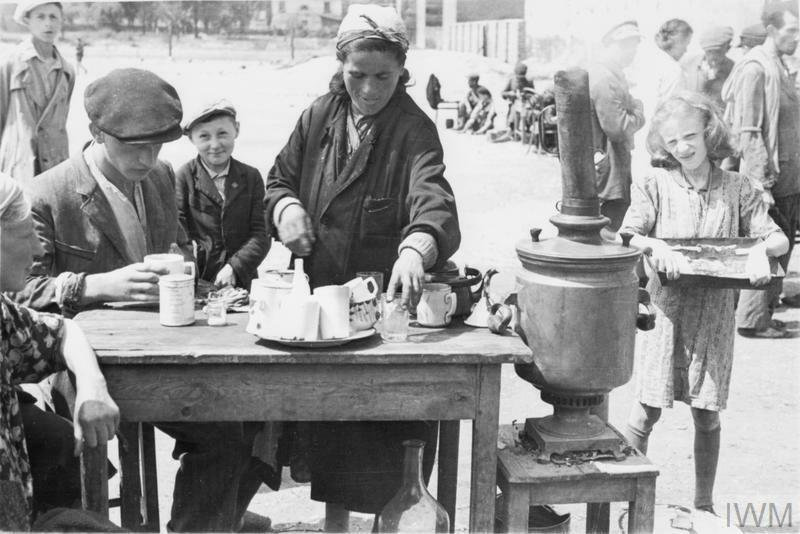 A woman serving hot drinks to customers from a makeshift café in a street market. 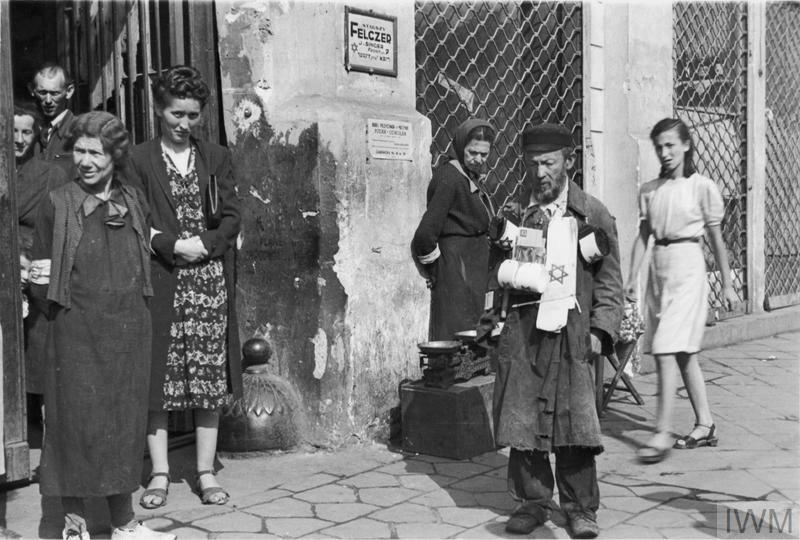 A street seller of armbands and a group of pedestrians probably on 18 Zamenhofa Street in the ghetto. There are two advertising posters on the wall in the background - for a Senior Medic (starszy felczer), named J. Singer and for typewriting services. 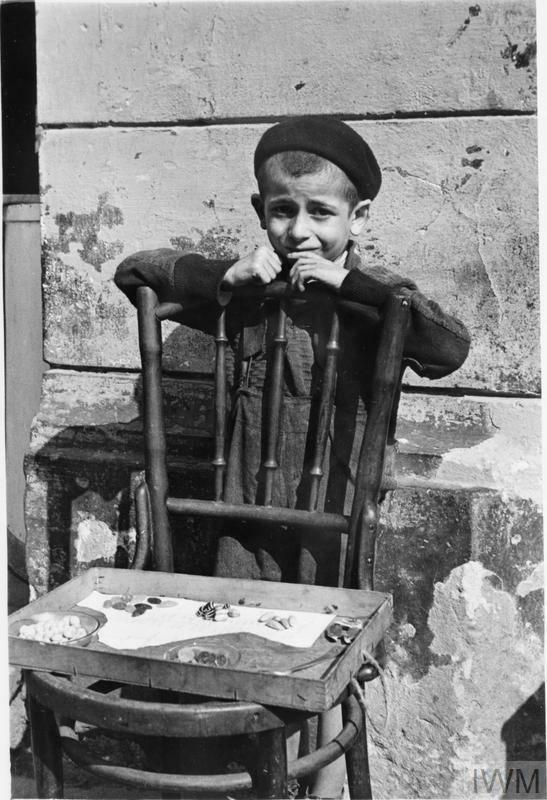 A shy, young boy selling a handful of candies from a chair in the street in the ghetto. 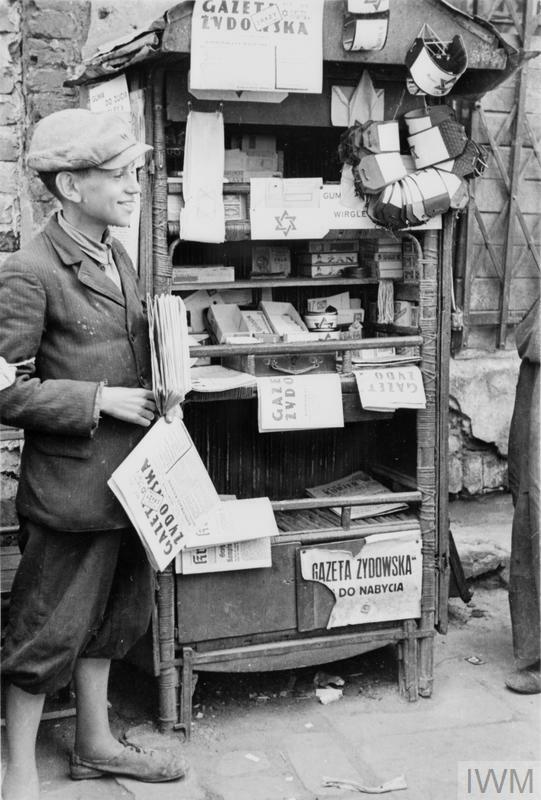 A young boy selling newspapers and armbands from his street stall. 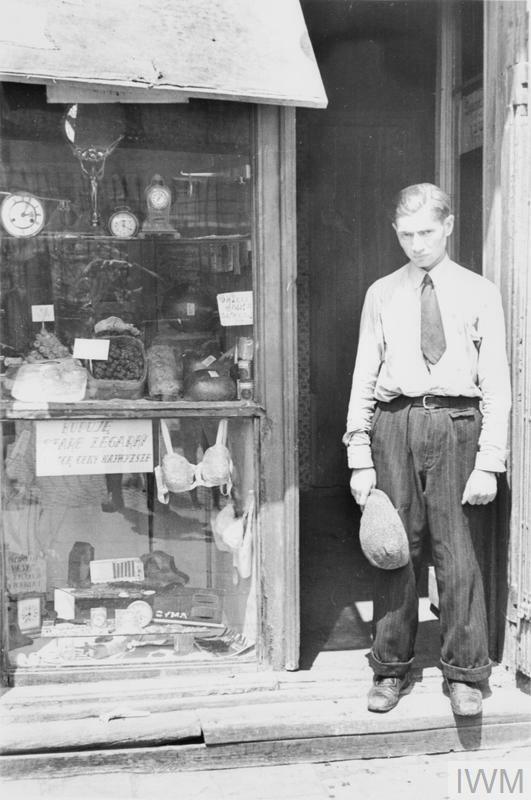 A young man in the doorway of a shop. He has taken his hat off, perhaps to acknowledge the German soldier photographing him. A group of men and children posing for a photograph in the street. A starving man and two emaciated children begging on the street. An emaciated mother with her twin daughters. Two emaciated children, one of them asleep or unconscious. An emaciated child eating on the pavement. A passer-by giving money to two children. An elderly man lying on the pavement. 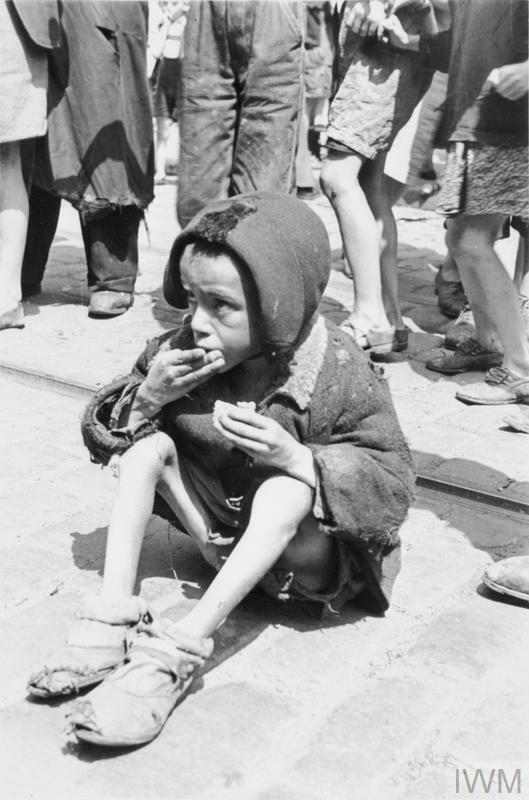 An emaciated boy sitting on a pavement with a crowd of pedestrians around him. 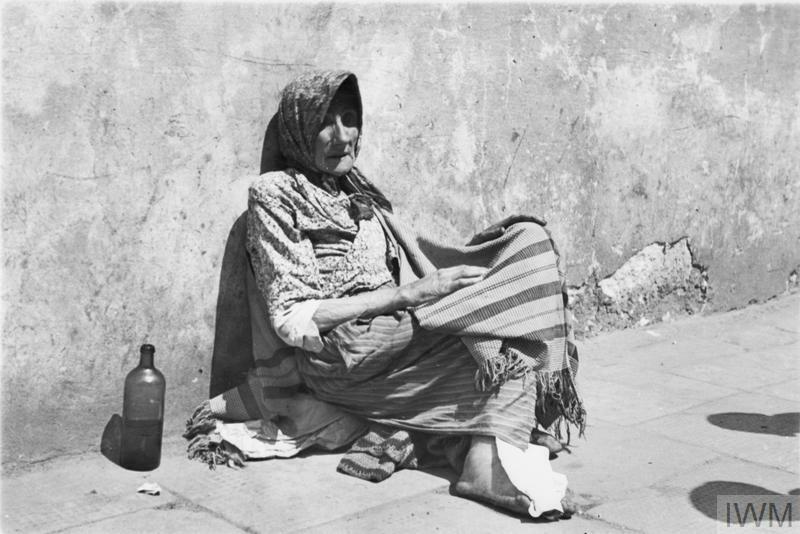 A destitute elderly woman begging in the street. 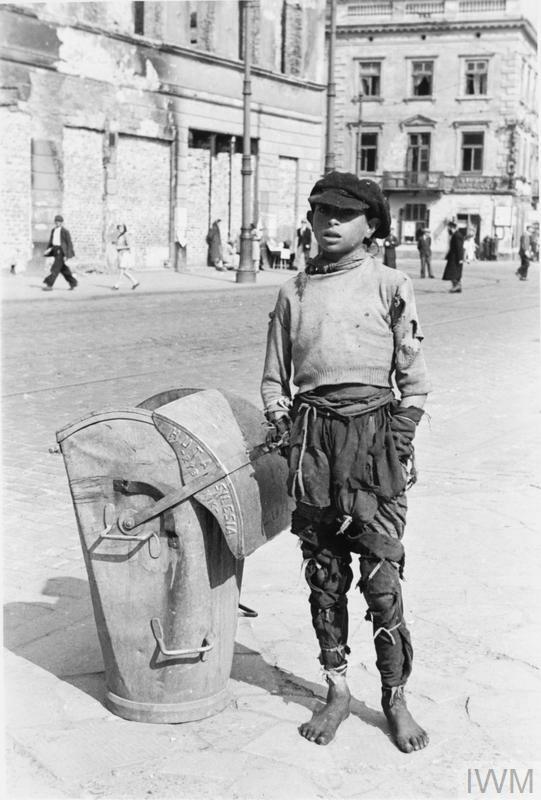 A teenage boy dressed in ragged clothes. 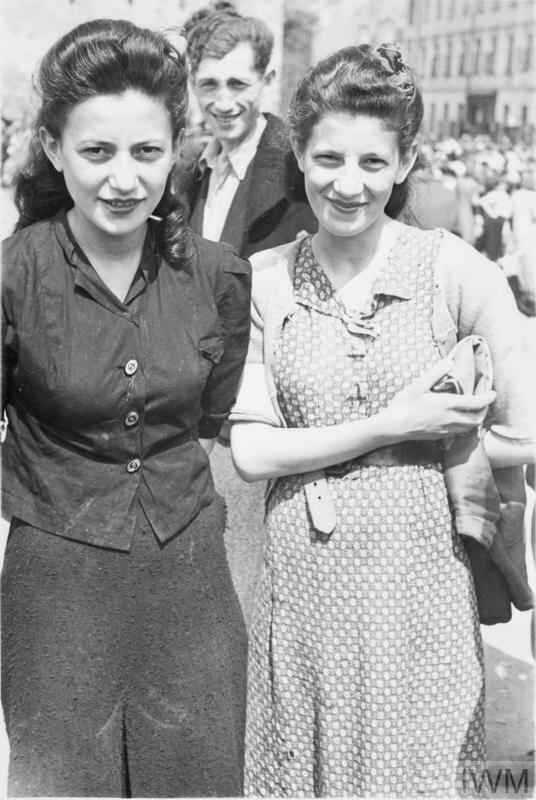 Two well dressed women posing for a photograph in a street market. Basic transport services were still provided in the ghetto. 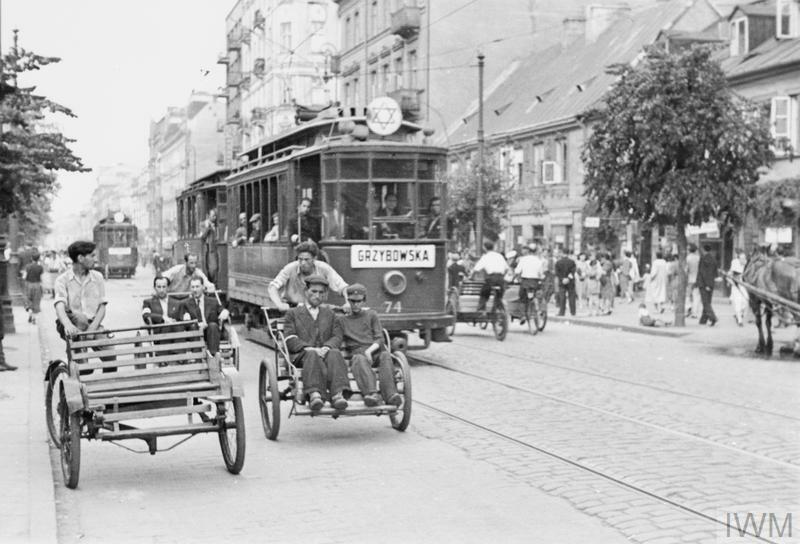 This photograph shows rickshaws and a tramcar carrying passengers along Leszno Street. 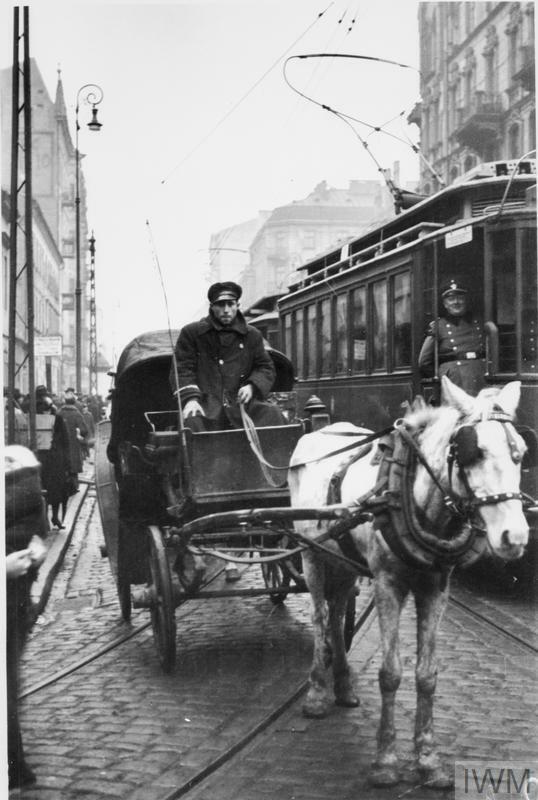 A horse-drawn cab driving alongside a tramcar on Leszno Street. There is a German officer in the tramcar. Pedestrians and rickshaws on Karmelicka Street in the ghetto. 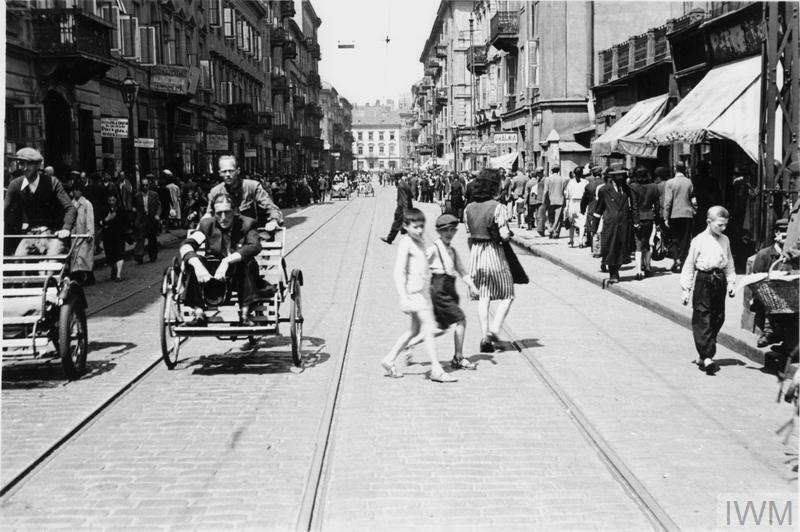 Pedestrians standing on a street in the ghetto, probably at the intersection of Żelazna and Chłodna (Grubenstrasse) Streets. 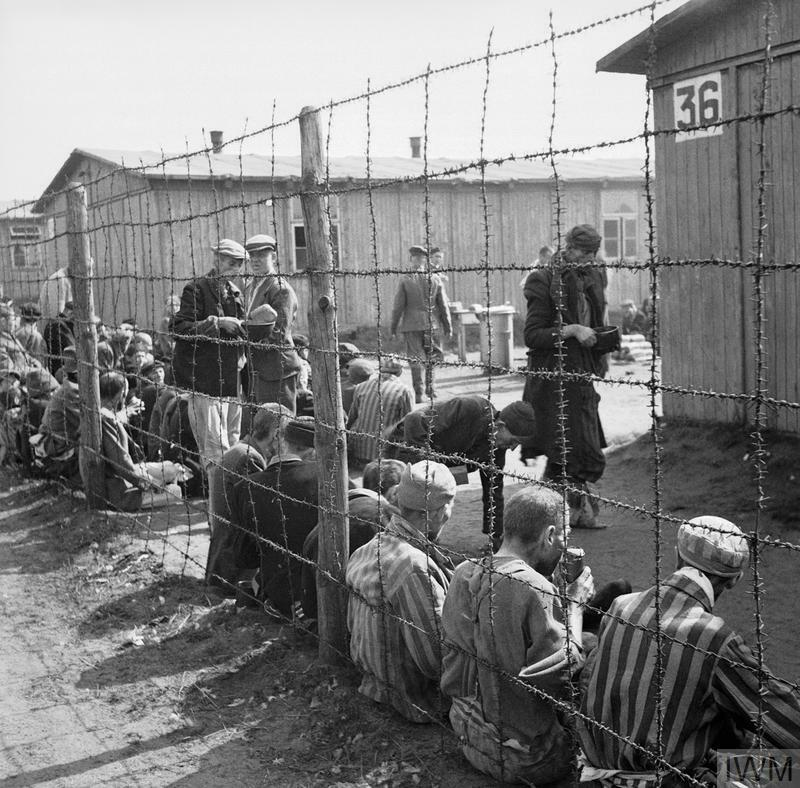 As the Allies advanced across Europe at the end of the Second World War, they came across concentration camps filled with sick and starving prisoners. The first major camp to be liberated was Majdanek near Lublin, Poland in July 1944.